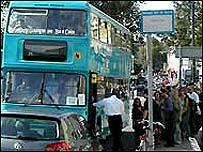 Hundreds of people queued for buses ferrying fans to and from the Ashton Court Festival in Bristol because the Clifton Suspension Bridge was shut. The decision to close the bridge came after trustees said the landmark could suffer "potentially unacceptable structural stresses". Shutting the main pedestrian route to and from the event left festival-goers on foot with a detour of several miles. About 40,000 people attended on Saturday with a higher total on Sunday. The second day was rounded off by headliners The Stranglers and, earlier, Bristol musician Roni Size. 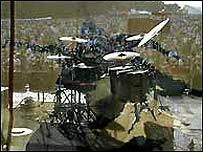 The festival, with its two outdoor stages and various marquees, featured scores of local acts. The line-ups under canvas included soul, acoustic and global music plus dance, poetry, comedy and drama. There was also a blackout marquee featuring experimental film and music plus sessions for deaf people involving visual displays, heavy beats and signing. The festival also had 150 stalls selling foods and crafts from around the world, two bars, fairground rides and entertainment for children. The Ashton Court Festival, formerly known as Bristol Community Festival, has been going for 30 years. For many years entry was free and costs were met through donations, programme sales and other fund-raising. Increased expenses now mean a daily admission charge of £5 for anyone over 14 years old and a parking fee of £5 per car. A journey on the special buses cost £1 for an adult and 50p for a child.